My trip to PAD Paris in the Spring of 2014 was a focus on vintage French design and visiting some of the usual locations of museums, galleries, flea markets and fairs to enjoy design, art and architecture. Cemeteries are not your usual touristic highlight but I included those as well, you can read about how that went here. Le Corbusier was obviously highlighted in my trip as he would for any architecture lover as was the flea market, which is open only on the weekends, was scheduled to be visited twice during this trip. This is when my love affair with ceramics from the south of France begins. Call me crazy but I don’t think I would get along with Le Corbusier, if he were still alive that is. Don’t get me wrong, I think he’s one of the most influential architects of the 20th century. I just picture him to be difficult. From what I’ve read he wasn’t much of a team player, wanted to take credit for other’s ideas and was pretty stubborn in order to get his way. A proud professor of thought. That said I wouldn’t miss an opportunity to visit his personal living quarters, now turned into a museum. One of the most intimate visits I have done while in Paris was to Le Corbusier’s studio-apartment located just outside the 16th arrondissement and to Maison La Roche, just walking distance from the studio. What excites me about these visits is having witnessed the use of architectural detail to create a custom and extremely personalized home space. Maison La Roche was the home of an art collector, so the space focuses on light: natural as well as artificial and wall space for exhibiting artworks salon style. Le Corbusier’s studio-apartment makes use of natural light and turns smaller spaces into larger ones by using extra large doors as room dividers. I recently saw a similar use of panels in glass by a design studio called Studio Ko, simply stunning. It seems like such a basic idea to personalize your smaller and larger spaces but unless you are into remodeling your home, it might difficult to conceive it. I think building out my closet has been the most personalized I've got and even that's pretty standard. If you are into flea markets, you’ve heard about and probably visited Les Puces de St-Ouen located in the 18th arrondissement. It covers seven hectares, is divided up into smaller sections and only open Saturdays, Sundays & Mondays. Porte de Calignancourt is the closest train stop however after a couple visits I decided Porte de Saint-Ouen is a much less chaotic and probably safer train stop, especially when leaving with your precious treasures. I never would have imagined the quality of the objects that you can find at the flea market. Jewelry from the turn of the century, Art Deco furniture, vintage furs, vintage silver, vintage lace. It was a ceramic pitcher by Michel Alexandrov alias Allix that stole my heart. 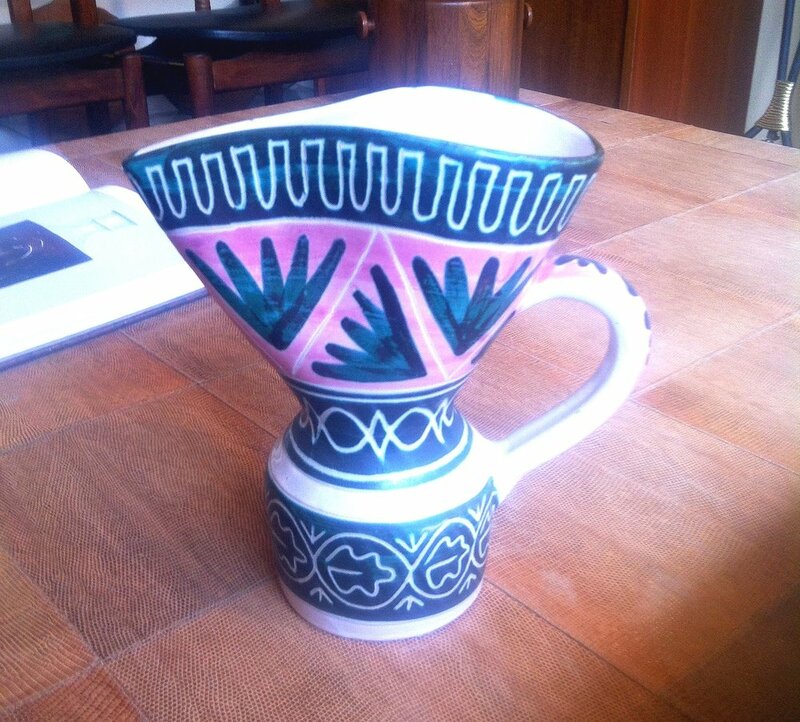 Decorated with a horizontal geometric shapes in bright fuchsia and turquoise on white glaze, it was SO Miami. In my broken French I was able to learn about ceramics from Vallauris, France from the 50s. Pieces by Robert Picault, Allix, Jean Derval and other ceramists were carried by a number of vendors at the flea. My enthusiasm was frightening to the vendor, making it hard to negotiate, however my bargaining position was that I was convinced the pitcher would never survive the trip back home because I was on my way to Milan and if it broke... (sob face). It was a steal. It’s always less expensive to purchase from the source, or as close to the source as you can get. Many French furniture dealers started their careers flipping goods at the flea. Interior designers and antique dealers visit from around the world. It is hours of treasure hunting and when you finally decide to take a break for lunch Ma Cocotte couldn't be a better place, not to mention the people watching is pretty fantastic. The Parisian feel market is a must for anyone who loves to treasure hunt, I think flea markets are great for the experienced design collectors as much as for the amateur because you really never know what you could. Another flea market that I love to visit, Brimfield, just right outside Boston. It doesn’t have the old European charm as does the flea in Paris but for vintage Americana, Brimfield is the place to go. Read more about my trip to Brimfield Part 1 & Brimfield Part 2.